Want more than 1 yard? Click on the the drop down box by "Quantity" to select how many yards you need. The double fold bias tape is approximately 3/8 inch (folded). With the crochet/lace edge it is just over 1/2 inch wide. No need for a bias tape maker! Bias tape by the yard creates a perfect mitered edge and wraps around circular shapes with ease. Crochet edge bias tape is perfect for quilt blocks, quilt binding, aprons, bibs, clothing or any sewing project that needs some added cuteness! It is especially adorable on children's clothing! 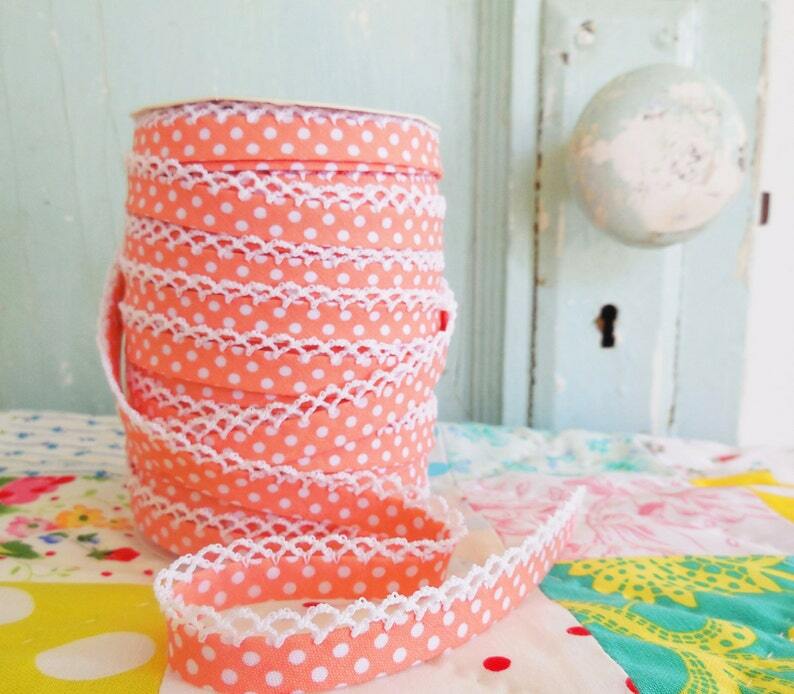 Convo us with questions - We hope you love sewing with this bias tape as much as we do! Purple Polka Dot Crochet Edge Bias Tape (No. 17). Sewing Supplies. Fabric. Quilting Supplies. Double Fold Bias Tape. Light Blue Polka Dot Crochet Edge Bias Tape (No. 10). Sewing Supplies. Handmade Supplies. Sewing Supplies. Quilt Supplies. Royal Blue Polka Dot Crochet Bias Tape (No. 11). Sewing Supplies. No Need for a Bias Tape Maker. Bias Tape by the Yard. Quilt Binding. Yellow Gingham Double Fold Crochet Edge Bias Tape (No. 84). Yellow Gingham Binding. Yellow Gingham Fabric. Yellow Fabric. Yellow Trim. Spring Green Gingham Crochet Edge Bias Tape (No. 89). Green Gingham Trim. Green Gingham Fabric. Spring Fabric. Bubble Gum Polka Dot Double Fold Bias Tape (No. 20). Pink Bias Tape. Pink Polka Dot. Pink Quilt Binding. Craft Supplies. Sewing Supplies. Fuchsia Polka Dot Crochet Bias Tape (No. 3). Vintagedoor. Quilt Binding. Sewing Supplies. Double Fold Bias Tape. No bias maker.